Q. robur (English Oak Tree) is a fast growing deciduous tree reaching 20m with a 20m spread and a low branching habit. Q. robur ‘Fastigiata’ has a more upright habit growing to 20 – 25m with a spread of 10m. Providing dense shade Quercus robur are widely used for planting in parks and for avenues. They prefer a well drained soil and do well in full sun. Once established Quercus robur are reasonably drought tolerant although they will suffer in extremely dry years. Quercus Robur (English Oak) and Quercus Robur fastigata. Both species are used widely in street planting parks and large gardens. Fast growing and classic shade trees Quercus Robur will reach 20m with a large crown and is often used in Avenue plantings. These are popular low maintenance trees well suited to broader landscape plantings. 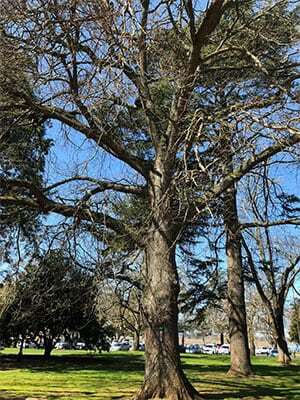 Used as a medium to large shade tree, and also useful as a street tree in broader streets. Can be grown beneath powerlines. Little pruning is required other than formative pruning to lift the skirt of the tree in pedestrian areas and to allow access for mechanical mowing in parks and gardens. Spread – To around 20 metres – Rounded canopy of medium density. Tolerant of Urban conditions – Yes. Drought tolerant – Mediun once established. 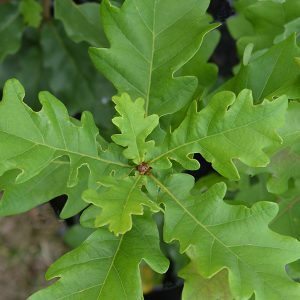 Quercus Robur is available for sale from the following wholesale nurseries.